Thought I would like to share with you my recent dyeing exploits – Merino softly spun dyed with Persian Berry Hue and Dye extract (5%) from DT Crafts. On the left Alum mordanted, on the right, Copper mordanted. 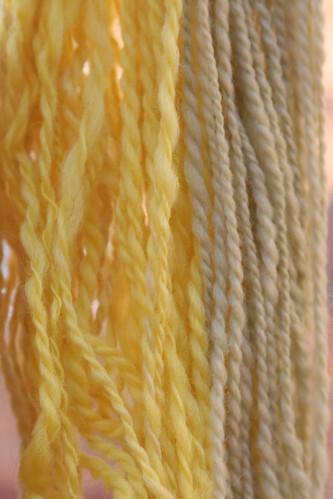 There is more softer greenish tinges in the original skein which the photograph has wiped out. Someone very kindly pointed out that we have a lot of chlorine in our tap water in Bristol, so when I tackle this again, along with the Weld, I am going to use either distilled or rainwater. I think I am going to find these very useful colours for tapestry weaving or felting. 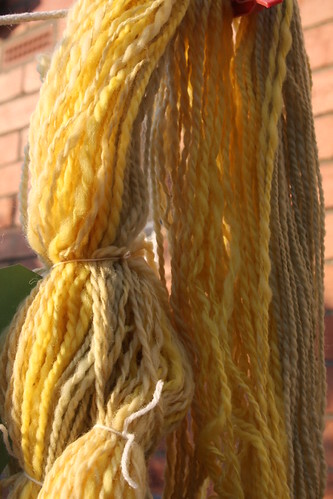 This is the line of spun wool that I have dyed previously but spun up during April. 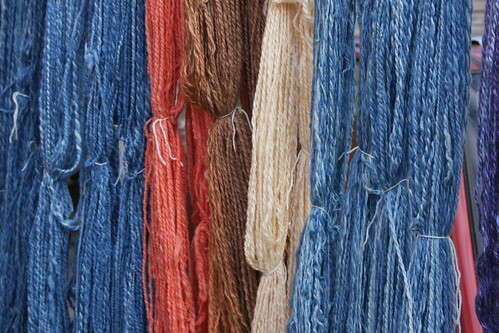 Left to right – Indigo (1st VAT), Indigo (2nd VAT) (Fiery Felts) , Madder (extract – Earthues, DT Crafts), Annatto (3rd Dye Bath) ( Pure Tinctoria purchased from Jane Deane) Indigo (3rd VAT). Really pleased with the way the colours co-ordinate with each other, and some are destined for one of my tapestry projects in progress. A lovely colourful post, Shani! It's interesting to see such different results from different mordants.